One of the most amazing pleasures of being a “bonafide horseman” is your access to the awesome world of the “backside.” In this maze of barns and shed rows, of strange equipment and straw piles, there exists a magical mixture of scents, sights and characters quite unlike any other in Creation. The time to be there is early morning. The world of the “backside” begins to come alive in the silent hours before dawn. The workday is nearing its end before noon – and by the time the outside world is locked into the hubbub of traffic and nightlife, the thoroughbreds and their legion of caretakers are already retired into the shadows and bedding down. At this hour, when everything is possible, these scores of racehorses look exactly like what they are: forty generations of breeding, millions of dollars on the hoof, and every one born to run. 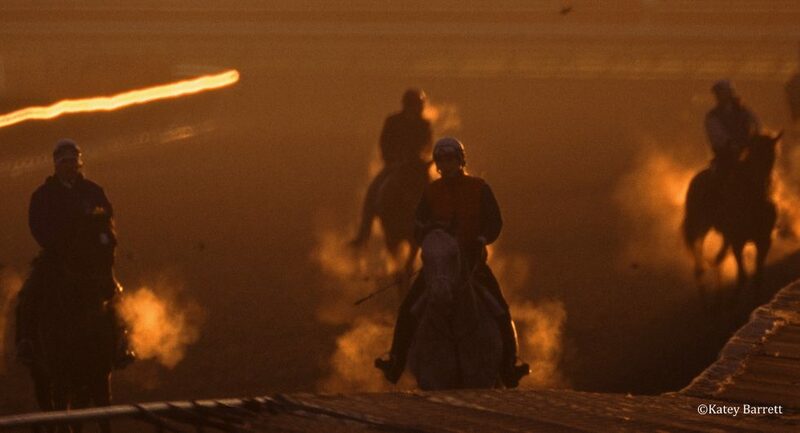 For some trainers and their barns, “morning” begins as early as 3:30, with the smell of brewing coffee, the thuds and snorts of stirring horses, and the sight of sleepy grooms starting about their work by the light of dim, bare bulbs. By 5:30, the backside has become a beehive of activity. The shadowless morning is permeated by the smells of sweet hay and soapsuds. The air swarms with commentary in accents from every corner of the Western world – from the fens of Scotland and the wilds of Australia to the mountains of Guatemala. And everywhere, there are animals… not only the thoroughbreds themselves, but trainers’ and owners’ dogs, the barn cats, chickens, an occasional goat – and ever-present sparrows busying themselves in the rafters, the dirt, and the eaves. Horses who will race that day are being walked, bathed, and examined by the State vet. Some are given pre-race Lasix and placed in isolation stalls. Most have muzzles to keep them from eating, to keep them “light” for the race; some stand up to their knees in plastic buckets of ice. Meanwhile, the other horses in the barn are being moved out, one and two at a time, to join the steady stream of other thoroughbreds from other barns. Every animal wakes in its own mood; some move out dragging their feet or with their heads hanging, half-asleep, while others are ready from the moment their stall door opens. But as the horses near the track, everything changes. Heads go up, ears move to catch every sound, some steeds prance and snort and arch their necks in anticipation. At this hour, when everything is possible, these scores of racehorses look exactly like what they are: forty generations of breeding, millions of dollars on the hoof, and every one born to run. As the horses enter the “gap,” you will see among the riders atop them famous faces and future Hall-of-Famers riding side by side with teenaged exercise “boys” and “girls.” Even the world’s top jockeys participate in this time-honored morning ritual. As the horses thunder by the rail, you will find yourself watching them among amazingly eclectic company. Next to the Official vet may be a millionaire breeder or owner in a warm-up suit; next to him could be a weathered tout – a man with a stopwatch, a notepad, and sharp eyes that never seem to blink. Scores of assistants flank their trainers, who are the only “royalty” recognized on the backside. Most denizens of the morning dress simply for warmth; no one much cares how they look (the real racetrackers only care how horses look). Yet the trainers, somehow, stand out. They seem to walk or ride with a different air. Watched by all, in this world they are stars. The morning workouts continue (interrupted only twice, when the track is cleared for renovation), with “sets” of horses coming and going in dizzying streams, until 10:00 a.m. But on the backside, there are always other arenas of action not to be missed. “The kitchen” is one of them. At nearly every track, the kitchen is a well-worn cafeteria/grill which serves not only as “breakfast central,” but a key gathering place for all denizens of the backside: jockeys, grooms, owners, trainers, exercise riders and sports writers drink their coffee, gossip, exchange “hot tips” and hunches, and pore endlessly over Programs, sports pages and Racing Forms. Every now and then, someone will get up and sidle over to one of the betting machines, if the kitchen has one. You might be dying to know just what horses that particular trainer or rider is betting, but there are little half-walls, like in voting booths, to keep it private. Never mind – you’d never really know anyway: in the tall tales of near-wins exchanged over the kitchen’s scarred formica the next morning, the last thing you’re likely to hear is the plain, unembroidered truth. Another flurry you don’t want to miss is the Draw, a ritual codified in verbal shorthand that names horses and riders for races to be run two days hence and held in the Racing Office. Around 9:30 or 10:00, when the Draw is normally held, you will learn which horses will run, which jockeys will ride them, and which post positions they drew. Though the Draw is all over in a few minutes, in some ways the fate of all the day’s racers – as well as their owners and trainers, their jockeys and the bettors – has been sealed for “the card” that will be run in two days. After the Draw, everybody wanders back to their posts to prepare for the public part of racing. But until the last “Official” is posted on the tote board at the end of the last race, the Draw, beside the morning workouts, will stand as the high-point of the backside’s day. In the end, the heart of the backside – perhaps even the heart of racing – resides in the lives “tucked away” at the barns and shed rows of every racetrack. The people who care for generations upon generations of the noble breed are themselves a special breed apart. Often they begin their career with horses in their early teens, as stable-hands somewhere, and more often than not, they continue on with horses until well past the age of retirement. The members of the vast backside “clan,” wherever they may reside, share an unusual braiding of qualities: in their souls, a philosophical resignation seems to live side by side – in perfect comfort – with the fiercest of principles and with dreams every bit as optimistic and fanciful as the names of their charges. Among veteran backsiders, personal superstitions abound – their source and alchemy as mysterious as the sworn-by liniments and “cures” stored in ancient jars and coffee cans in some secret cupboard in every barn. Though the backside workers – trainers included – are often related by blood or marriage or both (sometimes back several generations) they are usually bonafide loners. They tend to stick with their own (if with anyone) and, except for some top trainers and jockeys, they would rarely be found abroad in the “real” world of shopping malls, city restaurants and movie theatres. They prefer to live in dorms or barns or even tack rooms rather than “comfortable” suburbs. They may be transient, but only from one horse venue to another. Their relationships with people may not last, but their bond with thoroughbred sires, dams and foals – with the great, glistening beasts whose lives are in their care – can rarely be broken by anything. The secret language, the hierarchies, the customs and traditions by which backsiders live may seem to separate them from “progress”… to set them outside of the web of the world. But the truth is, they are part of a profound historical fabric – unchanged, almost untethered to any era or place – which stretches not only around the world, wherever races are held, but back in time to the first contests ever waged by desert Sheiks, by Spanish nobles, by Kings of England… by all other men and women who, like them, prized great horses above everything except their honor.